This is what my life looked like in 1966. 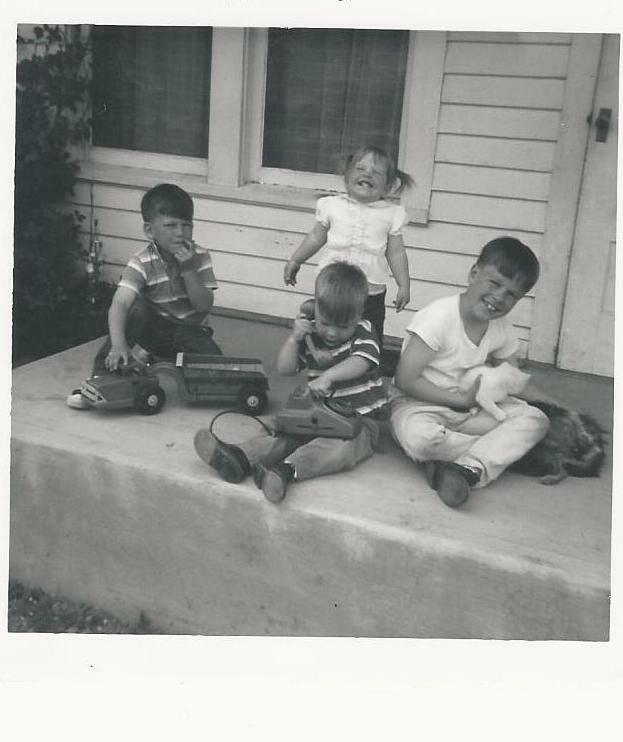 Here I am with my three biological brothers, laughing. I had a big laugh, deep, and from the belly. During this time, my dad worked on the railroad. In fact, he worked on the railroad from the time he was seventeen or eighteen until he retired some time in his sixties. When this picture was taken my mom didn’t work outside of the home, but in a few short years, she would work as a waitress, as a dispatcher at a police station, at a radio station, much later (when I was in high school) she worked at the American Embassy in Cairo. My mom had many jobs, and lived in many cities across the world, but my dad stayed with one job and still lives in the town I grew up in. There are three people who I can’t find, but who I would like to see, and tell them how they changed the course of my life. I would like to find the two men, whose names I do not know, that saved my life, back in 1997. One man pulled me to safety as I was standing on the railing over the Tacoma Narrows Bridge. On the same night, another man, pulled over to the side of I-5 and checked on me in my car. I was barely conscious, as I had taken two bottles of pills. He called 911 and stayed with me until help arrived. I didn’t know then, but I was about to begin the best sixteen years of my life. If those men hadn’t cared enough to stop and help a suicidal woman that was hearing voices, I would have missed all those amazing years of happiness. I am forever grateful to them. The last person I would like to see is my last psychiatrist. I had been seeing her for several years, and then one day, I received a letter in the mail, and the letter said, to choose a different doctor. It seemed that no one knew why she left. I asked my primary care physician, because the two of them used to work together, and she didn’t know what happened. For nearly a year, I kept calling her office to see if she had completely terminated her employment or if she had made plans to return. Eventually they told me she wasn’t coming back. I still miss her, and I want to tell her something. The last time I saw her, she told me, “As your homework, I want you to tell one person in your life that you have schizophrenia.” You see, she knew that I was living in hiding for over twenty years, and she wanted me to learn, by slowing coming out, that the world was a safe place. In her honor, I have come out to everyone in my life. I am now living in the open. I want to tell her the good and the bad. How people have reacted. I want to invite her to the performance of the monologue I wrote about living with schizophrenia that is coming out in May. I want to tell her, that I made it. I made it. The world hasn’t completely accepted me, but many people have. I want to talk to her one last time and say thank you. Thank you for always telling me I wasn’t crazy.